A complete change of scene this week as I’m in the final stages of planning our next big trip to the UK and Germany at the end of March – it will come around quickly! For the first part we’ll be visiting family (including our younger daughter, Mlle Chic Fille) and friends in the UK followed by a 9 day trip to Munich. As well as exploring Munich, we plan to use the city as a base to do some day trips into other parts of Bavaria. Monsieur Le Chic once spent a couple of hours as a backpacker in Munich rail station many years ago, whilst I have never been to the city before. We did make a brief day trip into southern Bavaria when we were staying in Innsbruck a couple of years ago and that certainly gave us the desire to explore the region further. It was a dull and overcast day in Innsbruck so we decided that it might be a good opportunity to hop on a train and over the border into Germany. Unfortunately the weather was somewhat inclement to say the least and the dreary Innsbruck skies gave way to torrential rain and sleet with occasional snow showers (not the pretty snow, rather the wet and slushy stuff). We were glad of the warmth and comfort of the train as we chugged up the Tyrolean Alpine passes via the ski resort of Seefeld before crossing the border into southern Germany and Bavaria. We were using Eurail Passes, which we had validated for both Germany and Austria (and also Italy since we also did a day trip to Bolzano and the Sud Tyrol from Innsbruck covered here). It was a quick and easy journey and we arrived at the pretty little Bavarian town of Mittenwald just under an hour later. The town centre is only a few minutes or so from the train station and I was keen to explore it having seen Mittenwald featured on a TV travel programme a few years back. Despite being late April it was bitterly cold – in fact the temperature barely hovered above zero degrees all day, which felt very cold to a couple of expat Aussies just coming off a long hot summer! The pretty little streets were charming though and many of the buildings had ornately decorated facades featuring painted frescoes or “Lueftmalereien” in German. Goethe referred to these artistic illustrations as “lively picture books”. They primarily date back to the 18th century and often retell stories from the Bible or depict dramatic events, such as fires and floods. Main street Mittenwald. Rathaus (Town Hall) in the background. The view back towards the Alps from Mittenwald main street obscured by the rain and mist! Even Monsieur Le Chic who doesn’t normally feel the cold found it rather chilly! Even on a grey day the frescoes were still pretty. Many of them are well over 200 years old and have survived the elements well! I don’t think the Shanghai China Restaurant was there in the 18th century though! The Parish Church of St Peter and Paul has a magnificent Baroque steeple! With the onset of more rain and sleet, our thoughts turned to warming refreshments so we headed into the nearest cafe we could find, which happened to be Zur Kaffeemuehle on the corner of Matthias-Klotz Strasse. The Matthias in question was a member of the Klotz family of violin-makers, who helped to make Mittenwald a notable centre for this craft. Matthias lived a long and productive life from 1653 to 1743. He was baptised on 11 June 1653 in the church of St Peter and Paul and was buried in the Church of St Nikolaus just over 90 years later! Next time I’d like to visit the Geigenbaumuseum (Violin-Making Museum), which is situated down a narrow little street near St Peter and Paul’s church. A statue of Matthias stands in front of the church, as the town’s tribute to this master craftsman. Monsieur Le Chic and I were much too cold to contemplate wandering around any shops selling beautiful violins (of which there are plenty) or any of the pretty little craft shops either. Instead we warmed up inside Kaffeemuehle with 2 steaming bowls of hearty minestrone soup, a creamy hot chocolate and for Monsieur a large mug of gluhwein. I sipped a little to taste and it nearly knocked my head off, but it didn’t have the same effect on Monsieur for some reason! Mittenwald and the neighbouring resorts provide many opportunities for skiing and the nearby Karwendelalp Cable Car will take you up into the higher mountains. In December the main town square lights up with the Advent Christmas Market, whilst in summer it is a popular destination for hikers. There is another special summer tradition for Mittenwald, but it is only held every 5 years. This tradition is the Bozener Market (named after Bolzano in the Sud Tyrol, now part of Italy). The River Isar (which flows through Munich) has its source just south of Mittenwald in the Alps and this officially marks the boundary of the Tyrol. Benefiting from its strategic situation, Mittenwald flourished as a trade centre from the Middle Ages onwards. Traditionally a huge trade fair was held each year in Bolzano, where the Venetians would showcase their wares to the rest of Europe, but, owing to political tensions, the market was moved to Mittenwald in 1487 and continued to be held there for the next 200 years. Nowadays the Bozener Market gives the Mittenwald locals a chance to celebrate their connection with the Sud Tyrol region. The next Bozener Market festivities are due to be held in August 2017! Apart from the Church of St Peter and Paul, the parish churches of Kruen and Wallgau, both situated on the Isar River, are also highly recommended for their beautiful frescoes. We decided not to linger any longer in Mittenwald as we were keen to have a quick look at Garmisch Partenkirchen, which was 25 minutes away by train. We walked out of the station at Garmisch Partenkirchen to find ourselves in a rather nondescript part of town. The station is situated between the 2 towns of Garmisch and Partenkirchen, which were originally separate towns until Hitler decided to have them combined for the 1936 Winter Olympics. A brisk 15 minutes walk down the hill, took us to the town centre. To be quite honest I’m not sure which part of town we were in (Garmisch or Partenkirchen) but it was a very pretty place with the (by now familiar) painted frescoes adorning the houses. Germany’s highest peak the Zugspitze (2964 metres) towers nearby – another place on my wishlist for a future visit! However on this occasion we had just enough time for a quick wander round and a cup of tea before heading back to the station as we were keen to get back to Innsbruck before nightfall. It was still rather a dreary day but the floral displays brightened things up! There were many shops selling the Tracht – the traditional costumes of Bavaria and Austria. Some of the ladies’ costumes were so pretty! 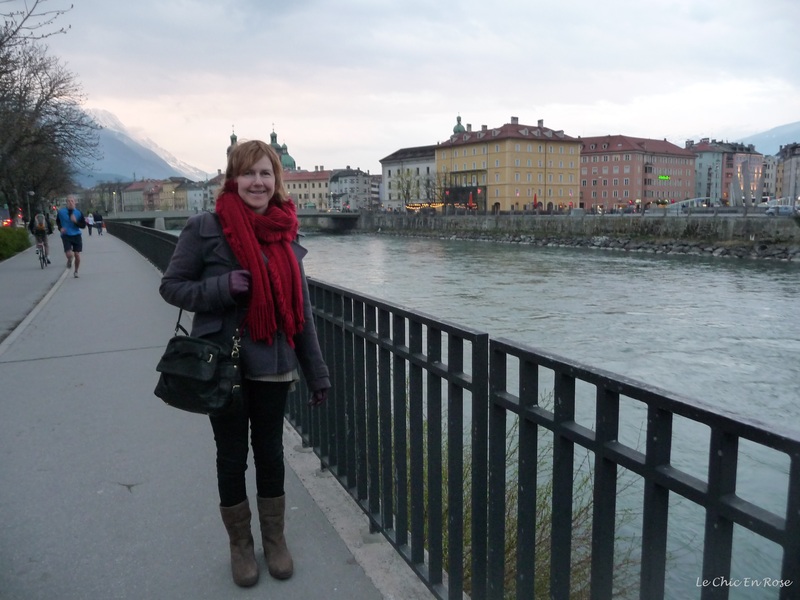 Back in Innsbruck we found it had brightened up sufficiently for a pleasant evening stroll down by the River Inn. For those of you who have been to Munich and Bavaria before, what would your main recommendations be? I’m trying to get my head around fitting in everything we’d like to do in only 9 days – we do want to go with the flow and relax and soak in the experience too! Tschuess till next time! Looks lovely, shame about the weather. I never considered going to Germany until quite recently. I found cheap flights to Friedrichshafen and now I can’t keep away. Leipzig and the Hartz mountains next for me. Thanks Andrew yes the weather was the only down point! We did a day trip to Leipzig when we were staying in Berlin and I can highly recommend it. Very interesting from an historical perspective not least because of its associations with Bach. The Bach Museum next to St Thomas’s Church was outstanding! Haven’t visited the Harz Mountains though – my knowledge is confined to an episode of Michael Portillo’s “Continental Rail Journeys”! That is exactly why we have decided to go there. Good old Michael! I loved Michael Portillo’s first 2 railway series he reminded me of an aristocratic Englishman of a bygone era which presumably is the idea! I think he has another series now so I’ll have to look out for the DVD! Just don’t follow his sense of fashion! I’m not really up to date with Manchester Gin as I last went there properly years ago (apart from transiting through the railway station recently – Manchester Piccadilly was packed it was quite stressful being there!). I did find this link which might be useful http://www.timeout.com/manchester/things-to-do/20-great-things-to-do-in-manchester – hope it works! I just know that people speak of Manchester as a happening place with museums, art galleries, great shops and lots of bars and restaurants not to mention the sport (Manchester United amongst other things)! It didn’t have a great reputation when I was growing up but that seems to have changed though there’s a big socio economic divide between the haves and have nots! It was a complete failure ! Time was flying, I had to do other things .. ah well.. maybe next weekend ! Innsbruck would have been lovely in June Rosemary! 🙂 I will definitely head over your way and read up on your cycling along the Danube posts thanks for pointing me in the right direction! We’ll be taking public transport and walking a fair bit too rather than cycling. April is a tricky month it can be delightful but still liable to wintry snaps definitely not cycling weather! 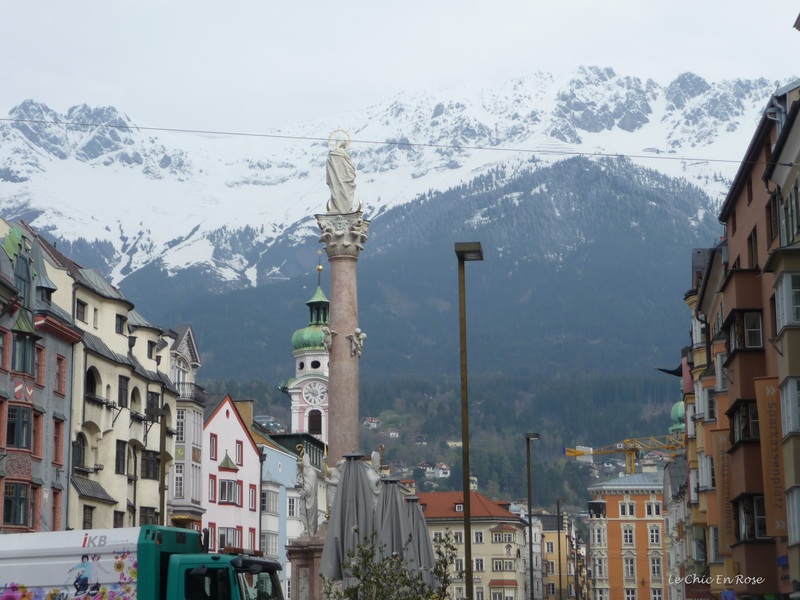 Fabulous pictures as always Rosemary – especially love the first one in Innsbruck with the snowy mountains! I’ve been to Mittenwald a couple of times, such a gorgeous little place and just stunning in summer. I had a friend who worked there while I was a student so used to go quite a lot. Trying to wrack my brains for places I enjoyed in Bavaria – Dachau comes to mind (although not enjoyable but very worthwhile), Passau / Augsburg / Regensburg are all nice little towns, Fussen and Neuschwanstein are also gorgeous as is Konigsee. Don’t miss the beer halls in Munich, Hofbrauhaus is very touristy but great fun and I remember enjoying the Augustinerkeller although there are stacks to choose from. You must be excited – I think I love the planning stage of a holiday almost as much as the travel itself – the sense of anticipation! I totally get what you say about enjoying the experience though, we have certainly learnt now not to overplan and try and fit everything in!! Hope you enjoy your weekend. We went to Munich for the Christmas Markets in Dec 2012 and loved it. The historic centre has lovely architecture though a good chunk of the city was bombed to bits so there are a lot of modern buildings as well. There are a number of excellent museums that are worth a visit; we quite enjoyed the Alte Pinakothek. I went to Dachau when I first went to Munich on a business trip and it was a very sobering experience. I was with a colleague of mine and his wife and for the whole duration of the trip back to Munich we were unable to speak and believe me my colleague is normally a talking machine! Great report and photos. I get to Munich often from the US. and always enjoy the Bavarian Hospitality. How many days will you be there? Some good suggestions already. One fun thing to watch is the Glockenspiel in Marienplatz. It rings daily at 11 and 12 “Pünktlich” as the Germans like to say. Lots of other great sights – Churches, etc. nearby. Also, not a far walk from the Deutsches Museum if you are into that type of thing. Muenchen.de is also a great resource as well. Ein Besuch nach München ist immer viel spaß! 9 days! Wow. Lots of opportunities also for some great day-trips in the local area. I don’t know if you have a car, but the train system is very efficient and fast. I could recommend Gray Line Tours, they offer some great short excursions that usually leave from the Hauptbahnhof area. Several years ago I did the “Romantic Road” trip was was really fun. Of course Neuschwanstein Castle is not too far away and is always pretty this time of year (but usually flooded with tourists). Final tip although I am not much of a beer drinker is one of my favorite hidden breweries: Monastery “Kloster Andechs” located near Starnberger See about an hour outside Munich by car. Have fun & we all look forward to your post and pictures! That sounds like a wonderful trip in the works! I was in the area in December (though I have yet to write about it!). I really enjoyed going to Linderhof Palace, which was surprisingly small but so richly decorated. And the Ettal Abbey was gorgeous too, and in the same town as the palace. And I do love Seefeld – great for cross-country skiing if you’re there during the season! Happy travels! Such a pretty part of the world, Rosemay, even with those leaden skies. Sorry I can’t be any help to you but I’ll look forward to the photos when you come back 🙂 I like Portillo too, but Andrew made me laugh! Beautifully captured in spite of the weather Rosemary. Makes me want to visit there someday! Thanks for dropping by my blog and leaving a comment. This blog has been a fantastic opportunity for me to have a first glimpse at where we will be visiting in May. 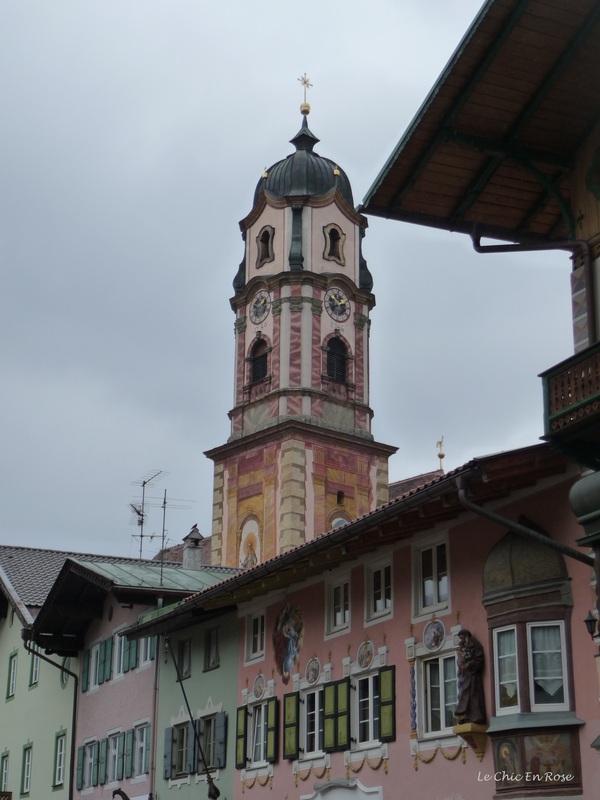 I did not even think anything would come up when I searched Mittenwald, I thought it might have been too small to warrant any travel blogs but I was pleasantly surprised to find this post. I simply cannot wait to see it for myself now! We’re hoping for some lovely spring weather but also prepared for rainy days too. I am beyond excited!! It’s my first trip outside Australia though so nervous as well. I am sure I will be returning to your blog many times before we leave. How exciting! You’ll be on that plane before you know it. And Germany is one, among the many, I haven’t been to … yet! Thanks Jill yes it’s coming around fast a lot to get done between now and then! I will relax once I get to the airport and my bags have gone through! Germany is such a fascinating country it was the first place I visited abroad on a music exchange programme when I was 14 (from the UK). Of course it was divided into 2 countries at that point – I went to the West. Your adventures in the south east of Asia have been very interesting to read about – Monsieur Le Chic is keen to visit Vietnam so that’s on the list for future travels! Ah, Vietnam, I haven’t been there … yet. Have heard good reports and I would find the French link very interesting too! High quality post. Your photos are excellent and they reveal what there are to be found. We have made some road trips in Germany, but these are waiting us. Thanks am glad you enjoyed reading and seeing the photos! There are so many beautiful places to visit in Germany – we are going back to Bavaria to explore some more in April 🙂 Hope you’ve had a good weekend too!